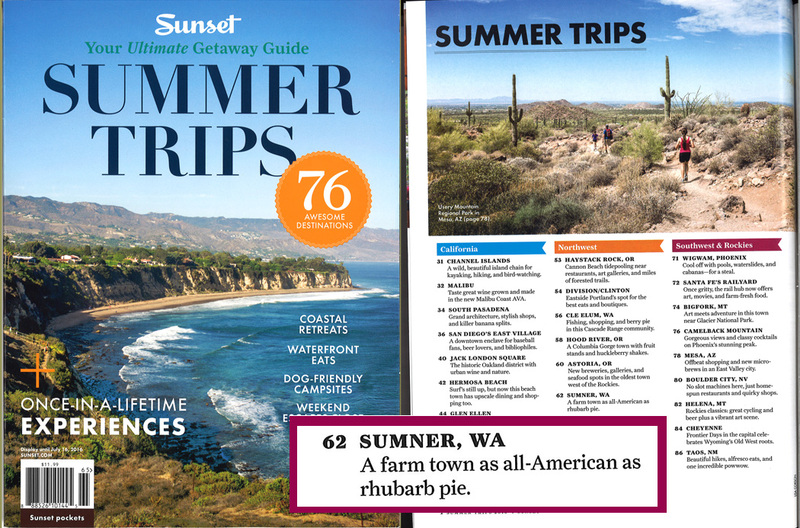 Sumner is proud to be one of Sunset’s 76 Awesome Destinations in their Summer Trips Getaway Guide. “Festivals on Main Street, family-run boutiques, and a new cycling path–this little farm town is as all-American as rhubarb pie.” They know us so well. The guide features the Berryland Cafe, Dixie’s Home Cookin’, Main Street Dairy Freeze, Windmill Gardens, VanLierop Garden Market, SugarBabies, Simple Tidings & Kitchen, the Sumner Link Trail, and Stuck Junction Saloon. Come discover the no-longer-such-a-secret summertime destination! The guide is on sale now through July 16.